The developer behind Shattered Dimensions is going to be handling all of Activision's web-slinging games for the foreseeable future. It's a good time to be a part of Beenox, the developer that created Spider-Man: Shattered Dimsenions. The game had some strong sales and strong reviews, but the best news for the developer came this morning. Today, Activision officially announced that Beenox was going to be "the primary developer on upcoming Activision titles featuring Marvel's famous web-slinger, Spider-Man." 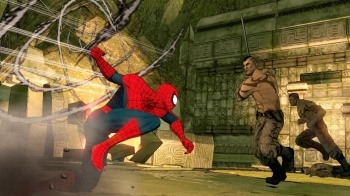 According to the publisher, the game "reinvigorated the Spider-Man gaming experience among critics and fans." While Activision didn't officially reveal a new Spider-Man game, the publisher's announcement all but confirms that such a project is in the works. The next such game might actually be a spin-off of Shattered Dimensions, as Beenox's creative director Thomas Wilson revealed to Joystiq that he'd like to work on a game based on Spider-Man 2099 or Spider-Man: Noir. Shattered Dimensions was one of those games that I enjoyed, but I didn't think it was as good as Activision seemed to believe it was. The combat was certainly solid, but I found the game to be a bit too repetitive and linear to have any replay value. That said, Beenox proved it was capable of putting together a decent game with a well-told story; hopefully the developer's next Spider-Man game features some more open-ended gameplay ... and the return of Neil Patrick Harris as the voice of Peter Parker.